The following is a guest post from Pascal van Opzeeland. Pascal is CMO of Userlike, software for website and messaging support. He and his team share tips about customer service and communication on the Userlike Blog. In school, everyone looks forward to the day they can stop learning and start doing. But once inside hamster wheel of working life, many long back to the times in which they had the time to invest in their personal development. The best employees have an innate desire to grow, but it’s hard to free up time when your daily tasks and duties mess up your schedule. Learning is one of those high importance – low urgency tasks that easily gets pushed aside. As an ambitious bootstrapped startup, we felt that Userlike needed a strong learning culture to succeed. Besides the positive effect on daily work it seemed like a good way to attract and retain high performing employees. 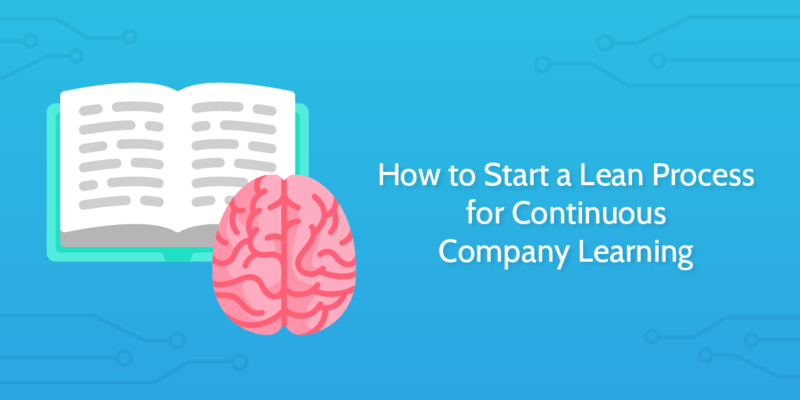 Instilling a lean process for continuous company learning has been one of my projects over the past year. The setup we have in place now works well for our team, and we believe it could be copied by others that are in a similar situation (small size – big ambitions). This is how it looks. At the start of each quarter, we all set up our goals in Asana. Besides operational goals (e.g. ‘raise monthly signups to 2,000’, or ‘publish 8 tutorial videos’), we set up personal learning goals (e.g. ‘summarize book X’ or ‘finish course Y’). The teammate and her team lead agree on these goals. We try to align them with our quarterly operational goals. Take Tamina, one of my colleagues who is starting a video tutorial project. We’ve set up a corresponding learning goal for her to finish a course on video editing. But the goal could also relate to a more general boost of skills – e.g. finishing a book on project management. Such specific goals offer guidance to our information consumption. It’s easy to become an ‘information junkie’, surviving on all sorts of shallow information. A podcast here, a blog post there. These can deliver valuable insights for sure, but they won’t give you the deep learning effects that you’d get with a (series of) well structured books or courses. To add a longterm perspective, we’ve started experimenting with personal learning plans in our marketing department. Instead of looking for a new learning goal with each new period, these plans outline a longer educational journey, with repeating topics to fortify our knowledge areas. In our weekly one-on-one’s, our team leads and members talk about how the work toward the goals is progressing. In our quarterly reviews, we do a post-game analysis of the past three months, picking out what went well and where things could be improved. We make sure to also discuss the learning goals in both forms of these feedback talks. This way we can spot obstacles in time, and we show that the learning goals are important and not just a nice extra. The third step in our continuous learning process is the educational budget. Every year, each team member is allowed to spend €250 on books, courses, magazines, events, etc. It’s not much compared to some budgets I’ve heard of from other companies. But we’ve found that if you’re aiming for the deep type of learning, €250 is more than enough. It amounts to 10 – 20 books. Not a big deal if you’re just reading through, but it is when you’re summarizing them (more on that later). We also have a shared library that everyone has access to, so they might not even need to spend a dime and still get the resources they want. 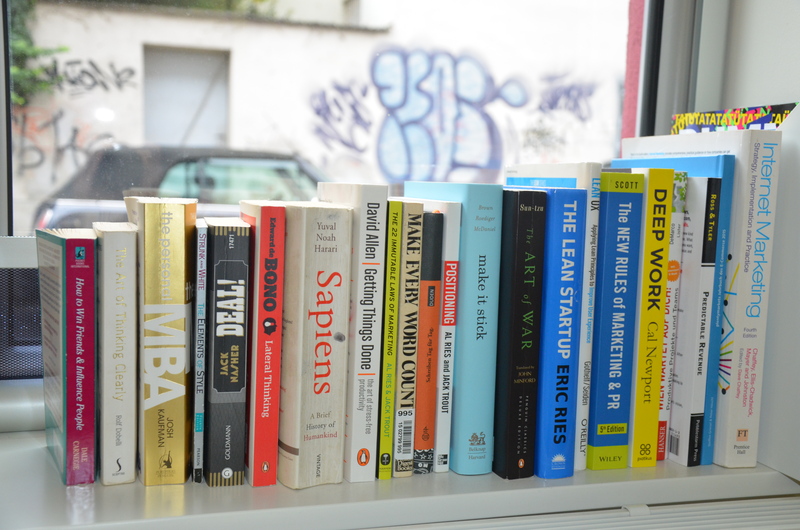 At a certain point, some of us started bringing their favorite business books to the office to share with the team. As others followed, this developed into the ‘Userlike Library’. Now we have a proper collection of classics on programming, UX, customer success, sales, marketing, management, productivity – but also some books on philosophy and history. Combined with the educational budget, the library is forever growing. When someone finishes a book bought from their budget, it goes into the library. Besides being a great resource for learning, seeing this collection of books together reinforces a sense of pride in your craft. The above steps reinforce the idea that personal development shouldn’t be an afterthought. But after a few months, we realized it still wasn’t enough. The learning goals were falling through the cracks, losing against daily tasks and quality time with family and friends. We realized that we lacked a strong, short-term incentive. Something more tangible than ‘mastery’. For a while we tried dedicating the first 30 minutes of our day to our learning projects, but this wasn’t working. I’m happy to say that when most of our teammates get to work, they are fired up to get going. Delaying this eagerness with 30 minutes of learning wasn’t healthy. Switching the 30 minutes to the end of the day wasn’t the answer either, because most brains are fried out around after 5PM. Just recently we’ve found a satisfactory answer to this problem. Especially our CTO David had a hard time scheduling in learning time between his team’s tight scrum processes, so he came up with the idea of compensation holidays. These are extra holidays you can earn by investing your free time in your professional development. Let’s say you go through an 8-hour online course on time management. With the compensation plan in action, you will earn this time back in holidays – up to five holidays per year (to prevent our team from turning into full-time students). So that online course would earn you one extra holiday. For this to work, we do require some ‘proof’. For courses, that can be a certificate. For books, we ask for a handwritten, chapter-by-chapter summary. This also guarantees the sought-after deep learning effects. Team members have less freedom with their compensation holidays than with the educational budget. You could use the educational budget for, say, an industry magazine subscription, but you wouldn’t be able to gain any compensation holidays from that. Only those learning goals that are agreed upon with the team lead – meaning that they are in line with company, departmental, or personal development goals – are eligible. What’s more, magazines or events aren’t suitable formats for creating summaries. Besides serving as a personal motivator, the holidays are also a valid justification to explain to your family, friends, or significant other why you would spend your private hours studying. It’s an investment they could also pick the fruits from in the near future. We encourage our teammates to share some of their newfound insights. This strengthens the freshly structured mental patterns, and allows others in the team to also hear about the highlights of the team member’s learning path. 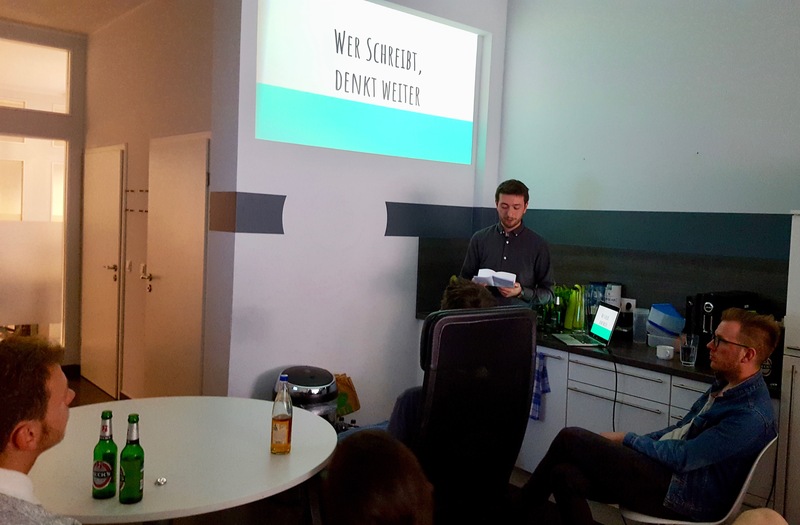 The channels we offer for this are a post on our blog’s ‘Userlike section‘, or a talk at ‘Userlike Thursday’ – our quarterly get-together for knowledge sharing. For this evening of beer, pizza, talks, and sometimes vodka, we encourage three of our team members to do a talk on the topic of their choosing. This topic could be something they happen to be interested in (e.g. protocols, online politeness, machine learning, carnaval), an explanation of what she or her department is working on (e.g. landing pages, a new feature), or whatever other topic could be beneficial to share with the rest of the team. Examples of experience/learning posts on our blog are Jan’s Surviving Complex Database Schema Migrations, Sven’s 5 Company Wide Benefits of Company Wide Blogging, or my 5 Simple Principles From 5 Years Thinking About Productivity. The ones appearing on the blog are often reincarnations of earlier Userlike Thursdays talks. So those are the blocks we’ve used to build up our process of continuous company learning so far. I can imagine we’ll do plenty of adding and adjusting of sticks and carrots in the future. Learning sharpens our inner algorithms for decision making. Having a process in place that enables your team to keep learning, keeps everyone engaged and raises the probability of making the right choices. What’s more, there are beautiful synergies to be reaped with content marketing. Companies like Buffer and Help Scout are largely learning entities who process and transform what they learn in highly useful information for potential customers. Do you have some tips on stimulating your team to invest in themselves? Or do you have a story to tell about your own professional development? I’d love to learn about it. Leave a comment below or hit me up on Twitter.